The point of having My Own Space is to write here, yes, but it also to organize things I have previously written. Think of it as taking a peek inside my desk drawer. I wrote this two days before delivering my second daughter, Beatrix. So as most people who know me know, I'm pregnant and on the verge of delivery. For anyone who likes a timeline, I am 39 weeks pregnant today and my official due date is February 4th. To clear up a little confusion, I was supposed to be induced on January 24th (last Thursday) but my doctor canceled due to a death in her husbands family and then she left to run a marathon in Miami. True story. My mother planned her vacation and purchased plane tickets based on my induction date so she is here in New York waiting for baby and being a generally good sport despite the fact that there is no baby in sight. I have a doctors appointment at 3pm today, so I'll update my preggo status later. I will include one short Charlotte Meffe story from last night. As anyone who knows her knows, this small nine year old has big thoughts and feelings. Here is an example. It was about 9:45 pm and Charlotte was (I thought) in bed. I heard light footsteps behind me and a big sigh. Sue enough, there was Charlotte headed back into her dark bedroom, 45 minutes past her bedtime. I followed her in, more than a little annoyed that she was still awake. "Pup, what's up? You've gotta go to sleep." Charlotte turns to me and it is quickly apparent that she's been crying pretty hard and for a while. Naturally my irritation quickly changes to concern. "I've been crying." Charlotte holds up her blue pillow which now features a large dark blue wet spot as proof. Waiting for the baby has been a double edged sword of excitement and anxiety. As much as Rob and I try to shield Charlotte from the pre-term labor, trips to get monitored at the hospital, and the general concern about the delivery (especially because I'm older) Charlotte feels almost every bump with us, so I wasn't surprised to see the wet pillow. I expected her usual monologue about how long she's waited and that it's time for the baby to come out already, but this time she had a different thought on her mind. "Mommy, I was thinking about a book I read. In it the main character describes the stars as lights in the night sky that are holes, and these holes are the pathways to heaven. The character describes them so beautifully, Mommy. She says she is holding on to the grass to keep from floating through one of those holes. Then, at the end of the book she very simply says that things get too hard and she lets go of the grass." Charlotte started to cry. "I started thinking about you and that you are 40 and delivering this baby and that is scary. So, I prayed to god that you'll be safe. Please God, please let her hold onto the grass." I walked over to the bed, took Charlotte in my arms and let her cry for a minute. Then I looked into her wet eyes and I promised, "I will hold onto the grass, I will hold onto you, I will hold onto this baby and we will be fine. I promise. I have a firm grip of the grass and I'm not going anywhere." Our grass has deep roots and my daughter is a miracle. I kissed her goodnight, walked into the living room and cried at the depth of it all. 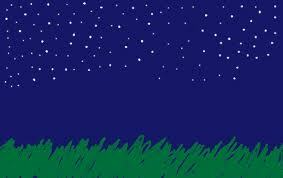 I will never look at the stars or grass in quite the same way, and I will hold on tight. I promise.